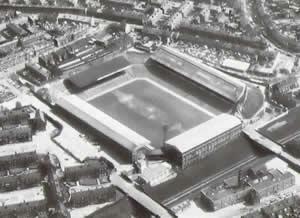 St. Andrew’s Stadium opened on the 26th of December 1906 with a league match between Birmingham City and Middlesbrough. 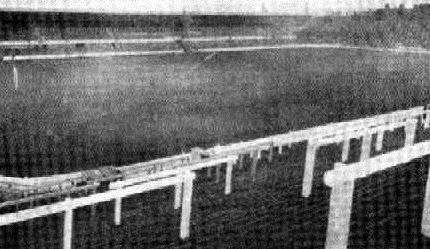 The stadium consisted of one covered main stand and open terraces on the other sides, with an estimated capacity of 75,000 spectators. Small improvements were made in the 1930s, mainly by increasing cover, and a record attendance was set on the 11th of March 1939 when 66,844 fans visited an FA Cup match against Everton. The stadium got heavily damaged in the Second World War, but got soon after rebuilt. 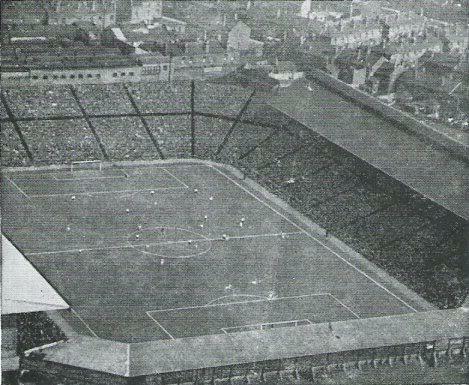 St. Andrew’s Stadium got further redeveloped in the 1950s and 1960s, first with the construction of a new main stand in the early 1950s, then with another new stand at the Railway End, and finally with the erection of new roofs over the Kop and Tilton Road end. No changes were made in the following two decades, and by the late 1980s the stadium had slowly fallen into disrepair. Capacity had furthermore been decreased to just 26,000 due to safety measures. In the early 1990s, Birmingham City therefore embarked on a redevelopment program, which started with the demolition of the Kop and Tilton Road terraces. Two new all-seater stands were built in their place. Works were completed in 1999 with the opening of a new stand at the Railway End. In the mid 2000s, Birmingham City was involved in plans to replace St. Andrew’s with a 55,000-seater multi-purpose stadium, however these plans never materialised. 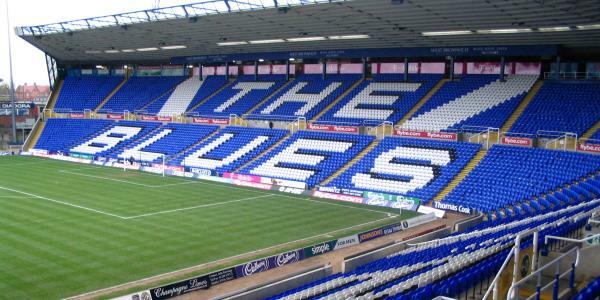 St. Andrew’s Stadium is located about 1.5 miles east of Birmingham’s city centre. The slightly uphill walk from Birmingham New Street Rail Station or Moor Street Rail Station takes about 30 minutes. Alternatively, bus 17, 58, 59, 60, 97, and 97A connect the stadium with Moor Street Station (or Digbeth Road). The journey takes 15 to 20 minutes. On matchdays, there are also trains that run to nearby Bordesley Rail station, which is a 10-minute walk from the stadium. On non-matchdays this station is out-of-use. St. Andrew’s lies just off the A45, which connects with the M42 in the east and the M38/M6 in the north. At the Bordesley Circus roundabout turn east onto Coventry Road. St. Andrew’s Stadium is located in a rather quiet residential area with little around. As usual in England, there is always the odd pub, though you find many more options in Birmingham’s city centre, which is not far away. There are, for example, various eating and drinking options south of Birmingham New Street Station, from where one can walk or catch a bus to the ground. There is an Ibis Hotel a few minutes walking from St. Andrew’s, while Royal George Hotel lies right at the back of the stadium. Both are reasonably priced and get acceptable reviews. The Moseley Arms is a similar alternative located slightly more toward the city centre. Click here for all hotels near St. Andrew’s Stadium. If you have a little more time on your hands, staying in Birmingham’s city centre may be a better alternative though. In particular from one of the hotels just south of Birmingham New Street Station it won’t be too hard to get to the stadium. Tickets for Birmingham City games can be purchased online, by phone +44 (0) 844 557 1875, or in person at the Ticket Office at St. Andrew’s Stadium. If tickets remain, these can also be bought on the day of the match at the stadium. Birmingham City rarely sells out in the Championship. Ticket prices typically range from £25.00 for an upper-tier seat behind the goal to £30.00 for a seat at one of the long sides. Tickets are £5.00 cheaper if bought in pre-sale. For more information email ticket.office@bhfc.com or call+44 (0) 844 557 1875. Birmingham City organises guided stadium tours that include the dressing rooms, players tunnel, press room, and dugouts. Dates, hours, and prices will be announced on Birmingham City’s website. Bcfc.com – Official website of Birmingham City FC. Visitbirmingham.com – Official tourist information for the city of Birmingham. Networkwestmidlands.com – Bus maps, timetables, and journey planner..
Great when in full voice makes the hairs on your neck stand up. Proud to be a blue. KRO. St Andys is the best stadium EVER. They got sick hot dogs at half time and the roaring of the crowds is ear-aching but is what makes me me! Sometimes my dad says lets calm down on the hotty dogs but I say no go get me a coke ya fatty. Home of the loudest and proudest fan in the country, there isn’t nothing louder than a full St Andrews and everyone singing Keep Right On! !